Page is a main unit of content in AxCMS.net. Pages are based on templates. Templates are ASPX-files with HTML and content placeholders. 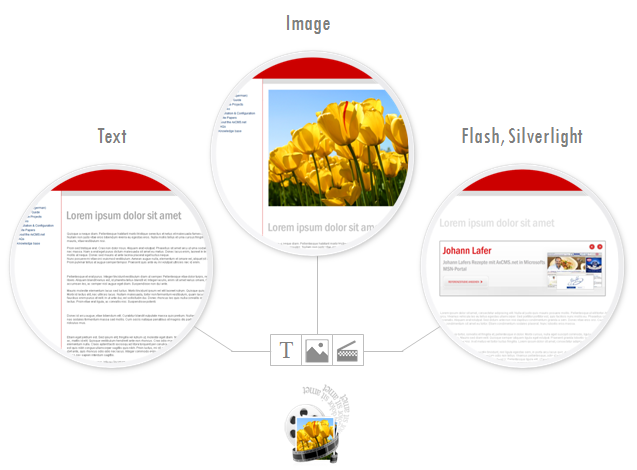 Placeholders accepts content (text, image, flash) or structure elements. Structure elements can be stuctural, static and dynamic, can have parameters and can contain further placeholders. As the name Content Management System suggests, it is all about managing Content. But what is content? The main units of content that AxCMS.net operates with are referred to as Pages. An editor creates pages, edits pages and publishes pages. The pages are attached to the navigation. Permissions are given to pages. Approvals are made for pages, and so on. A typical AxCMS.net instance handles hundreds or even thousands of pages. How can a consistent look, feel and functionality be achieved for all pages? A Page Template ensures that pages are consistent. The programmer (or designer) develops a Page Template and defines the layout of the site. Templates can also have special functionality attached to them. Page Templates usually have Content Placeholders - places, where the editor can add the content. The editor, when creating a page, selects a Page Template (from the list provided by the developer). For a single template there can be many pages. A web site can consist of a single page template or have multiple page templates, depending on the requirements. Technically, a page template is an ASPX-file. Any ASPX can be transformed to serve as a AxCMS.net template. HTML formatting options can be limited at the level of individual tags and attributes. The developer/designer defines a "white list" for the formatting indicating which tags, attributes and their combinations are allowed. The WYSIWYG editor follows these rules and shows only the relevant tools. The HTML-editor also adheres to the defined rules and filters out all prohibited tags/attributes as it saves. Specific styles can be added to the editor toolbar. Using CSS for text formatting is highly encouraged. Designers can define particular styles (e.g. headings, highlightings, etc.) and these styles are available to the editor directly on the toolbar. In addition, small HTML-snippets (HTML code templates) can be defined and added to the editor toolbar. 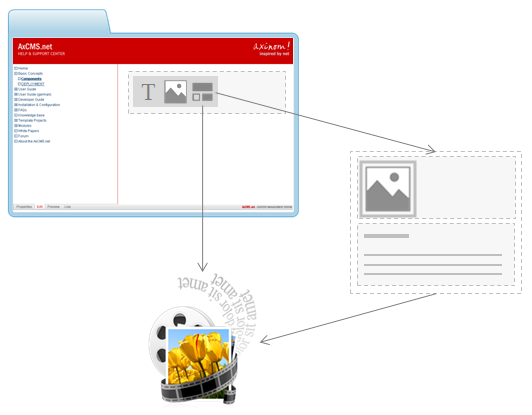 Images can be uploaded into AxCMS.net (see Document Management) and added to a page. With Image Formats uploaded, images can be automatically adjusted. Predefined formats (e.g. JPEG, 300x200) are created by the designer and attached to specific placeholders. If an editor adds an image to a placeholder which has a defined Image Format, it is automatically applied to the image. The editor can then adjust the formatted image - scale in/out, rotate, etc. Tooltips can (and should) be added to every image. Images can also be linked. The target can be opened in the same window or in a new window, whichever is specified by the editor. Links can be tracked and information about the clicks can be accessed and analyzed. Refer to the white paper Business Intelligence with AxCMS.net for more information on this feature. In addition, there is a built-in Link Checker which periodically visits all the links in the system and stores their status. This information can also be accessed and analyzed. A link to a page or a document is considered as a dependency. (see Workflow), When attempting to delete an object which is linked somewhere, a warning will be given. Similarly, a warning will be given if a page is published which contains links to yet unpublished documents. A macro language allows an editor to access the properties of the current page / current user and use them inside the text. Flash-objects are supported by AxCMS.net. An editor can upload a flash-file (.swf) (see Document Management) and add it to a placeholder. AxCMS.net automatically shows it. Many additional options are possible. For each placeholder it can be defined, which content types are allowed and how many objects of each type (text, image, flash) can be added. For instance, one placeholder can be defined to accept only text while another placeholder can be defined to allow exactly one image. Structure Elements are probably the most flexible part of AxCMS.net. A structure element can be viewed as a predefined piece of HTML which can be added to the placeholders in a page and which can contain further placeholders. Structure elements can be nested to create complex layout and content structures. A Structural Structure Element is really just a piece of HTML with placholders. It can be used to create reusable pieces of layout. Static Structure Elements are ASP.NET-controls, i.e. they can contain both HTML and behaviour (programmed by the developer in ASP.NET). Static elements can have parameters, which are specified by the editor when adding the element to a page. The parameters can be used in the code of the element. Static structure elements during Publishing are transformed to pure HTML. This means that in the Live System such controls are simply HTML without any behaviour. Dynamic Structure Elements, like Static Structure Elements, are also ASP.NET-controls. There is however one major difference - Dynamic Structure Elements are processed in the Live System each time they are accessed. They are maintained in the published pages as ASP.NET Controls. This enables various levels of interactivity on the live side. Dynamic structure elements can also have parameters, however they do not support placeholders for content (This is because of their dynamic nature. The presentation of a control is decided only in the Live System, whereas content is added to the placeholders in the Management System). The developer can create a custom editor with convenient controls and layout for a structure element.